Piggybacking Credit » Everything you need to know in one page! Piggybacking credit is the quintessential term used to describe the process through which a user of authorized user tradelines increases their credit scores. “Piggybacking” is slightly literal; just as you would jump on someone’s back for a piggybacking ride, you jump on their back for a credit ride. That is, when you’re added as an authorized user, you’re piggybacking on the credit history previously established by the primary account holder. This information reports to your credit report even though you weren’t the one to establish that previous credit history. We have gathered a list of questions we’ve been asked (repeatedly) over the years concerning this topic. Please find below the questions and answers and please contact us should you have any questions. Does piggybacking credit still work in 2017? Whether piggybacking still works is a question from the “FICO ’08” myth that floated around back in 2007 and 2008. FICO is simply a company and does not dictate, create or enforce the laws of the United States. The FICO ’08 model is used by a small fraction of lenders, and even it were rolled out to all lenders tomorrow, FICO has already admitted it will continue to consider piggybacking credit lines in their scoring model. If you want to learn more about FICO ’08, please see our blog post dedicated to FICO ’08: FICO ’08. Regardless, tradelines for sale remain a viable option to enhance credit scores. Where did piggybacking credit come from? Piggybacking credit has been used for nearly 40 years by mortgage brokers and lenders. It became a popular way to boost credit scores because of the Equal Credit Opportunity Act 1974, which allowed the process to legally attach credit accounts to someone else. Is piggybacking credit legal or illegal? We cannot give you legal advice and this should not be construed as legal advice, but piggybacking credit is authorized by the Equal Credit Opportunity Act of 1974 and the Federal Reserve Board Regulation B. To learn more about the legality of piggybacking credit, please read our blog post: Are tradelines legal, illegal or moral? How do I find the best piggybacking credit companies? There is no easy way to navigate through the web filled with scammers and companies pretending to piggybacking companies, and those who are legitimate and reliable piggy backing companies. So, we recommend you use your judgment and conduct due diligence. There are some alarming signs to look out for, such as: do they take upfront fees in violation of the CROA Section 404? Is the piggybacking company actually registered with their state (Corp., LLC, etc.)? Lastly, call them and talk to them. Did they answer the phone? Did they call you back? When you did talk to them, did they sound knowledgeable or were they more interested in your money? How long does piggybacking take? This depends on how you define piggybacking credit. If you mean, how long does it take to be added as a “piggybacker” to the line of credit? Then the answer is about 15 to 45 days. If you mean, how long does it take for the results of piggybacking credit to materialize? Then the answer is: instantly after the account reports on your credit report. If you mean, how long does it take to receive the benefit of piggybacking credit? Then the answer is: that it is up to you to have your funding efforts in line, because the credit score benefit is instant (after it reports). Is piggybacking the same as credit repair? Absolutely not. Credit repair, in the most basic definition, is removing negative items from your credit report. Piggybacking credit, in the most basic definition, is adding positive items to your credit report. While both result in your credit score increasing, you cannot piggyback your way out of a damaged credit file. There is a threshold of negative items which will prevent piggybacking from working. So, you should call us and ask for a credit report analysis so that we can help you determine whether you need a credit report prior to piggybacking credit. How much will my score increase after piggybacking credit? The addition of this simulated tradeline increased the credit scores for this group by an average of 22.4 points over the starting mean score of 37.9. As expected, individuals with thin credit files (2 or fewer non‐authorized user tradelines) also experienced large increaes in score, with their scores rising on average from 44.6 to 64.0. – Board of Governors of the Federal Reserve System, Washington, DC. My husband and I were added to a few of my brothers credit cards. Its been over 45 days since he did this but my husband’s credit report has not been updated. Mine updated almost immediately. why would this happen? First, it may not be happening. Perhaps your brother didn’t add your husband. Perhaps he did add him, but much later when you said “Hey, the account didn’t show my his account,” which maybe your brother go “Oh, crap… ummm, let’s add now.” Maybe he did add it and maybe you’re not actually updating his report. Perhaps it is there? Alternatively, he could have fraud alerts and security freezes. Your addressed might be different. Maybe your brother put his name wrong. Is this really the case? If so, is there a way of getting an AU account to report as “legitimate” so you get the full score increase benefit instead of getting the ‘minimum benefit’? Joe, we love questions and never get tired of them. Your question is a good one, but has been answered many times and I have no problem answering it again because if you have this question someone else might have it as well. To bottom line it: the law requires that banks shall consider authorized users and if they don’t they are subject to fines. Since that is the case, a scoring model which doesn’t include authorized users with force the bank to violate the law if the bank used it. As such, no one uses the FIC0 ’08 scoring model. There’s not a thing as an illegitimate authorized user. That’s like saying there’s an illegitimate cosigner. The entire FICO ’08 extravaganza was merely public relations stunt to inspire confidence in their algorithms; nothing more. If you were to add trade lines to your file today, your credit score would increase. Period. Whether your score increased to a economically significant extent depends on what’s currently in your credit report and what kind of funding goals you’re trying to obtain. Can piggybacking increase one’s available credit and potentially lower one’s credit utilization on their credit report? Mathematically and score-wise, yes, but not actually. Meaning: Your debt to credit ratio will go down, but, obviously, it will not change the amount of debt you have (so your purchasing power will not change, but your credit score will increase). Does that make sense? If not, please follow up and I will clarify. Say I approach my Father who has his credit card accounts in good standing with 100% payment history and lower than 10% credit utilization. Could adding me as an authorized user effect his score in any way? No. It’s a one way street. However, you if have the card in your possession and he gave you spending ability and you racked up debt, that could negatively affect his credit score. 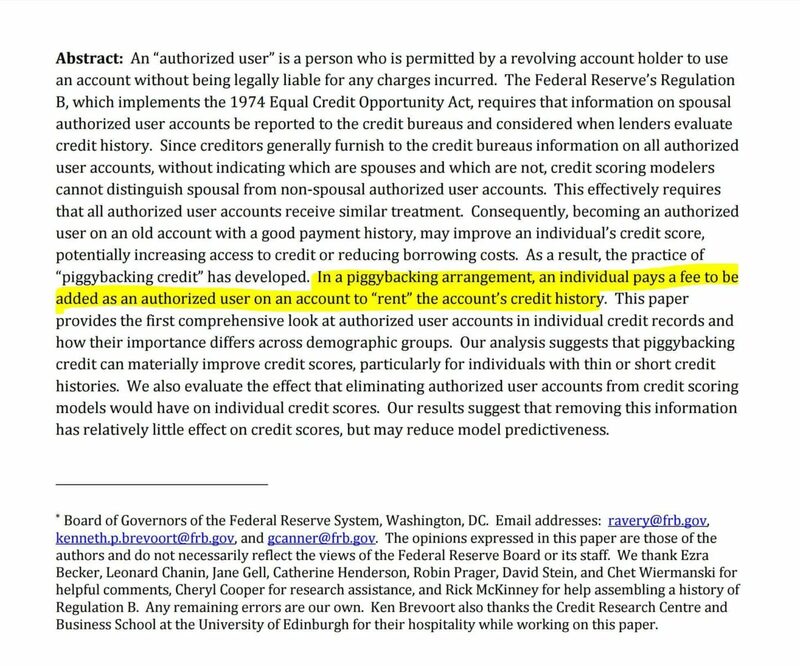 But, the mere act of adding you as an authorized user does not affect his credit score in any way. If I’m piggybacking off of someone with a credit line of 50k. How soon would I️ be able to get approved for that same credit line? Kenny, it’s a great question. So, it doesn’t work the way you suggest. Piggybacking off of a tradeline does not result in obtaining a similar line. Piggybacking increases your credit score, only. When banks underwriter your application, they will determine the limit of your line by calculating your income and current debts/payments (that is, they will determine your borrowing power). Piggybacking off of authorized user tradelines helps with funding, but in other ways. For example, piggybacking can increase your average age of accounts. It can decrease you debt to credit ratio. It can increase your positive payment history. All of this results in a better credit score, but none of this (as far as authorized user tradeliens is concerned) will increase the amount of money a bank will lend to you… that’s all determined by your ability to repay, i.e., your income minus liabilities. Piggybacking will get you passed certain thresholds like being approved at all or getting you approved with favorable rates. Hope that helps! Nope. We guarantee 2 out of 3 credit bureaus. Piggybacking tradelines can increase credit scores on the bureaus to which they report and lenders typically pull one bureau or a “mid score,” which means they remove the high score and the low score and pick the score in the middle. So, when you’re piggybacking, you should know what you’re lender is going to do. If they pull a mid score, for example, which 90% of lenders do, then you don’t need 3 out of 3, you only need 2 out of 3, because the middle score will be positively affected. Hope that helps! How’s long should someone piggyback? Is this a lifetime agreement or is there a certain timeframe where the authorized user needs to be removed? Our agreement provides for 45 days of active reporting. Thereafter, it could stay for many years. You want to take advantage of the credit increase as soon as possible because the impact of the tradeline goes away over time, even if it is still there after many years. Yes and no. More from nothing is one thing more from a lot is another. You can overdo it. Aspirin is good for you, but if he took too much it would make your stomach bleed. In the same way, too much of a good thing can be bad for you. The trick isn’t guessing, but discussing your specific credit situation with someone who is been dealing with trade lines for many years. Go here: https://superiortradelines.com/start/ And we can give you a better answer. Hey Agustin! How long you let someone piggyback depends entirely on your goal. Friends or family? As long as you want. As a business practice, no more than two cycles. Yes, there score will begin to decrease month by month after you remove them. We have a great video here about how long tradelines last. If that didn’t full answer your question, let me know. Can someone with a blank credit score, can still piggback and get a 750+ score? The more cards the better or faster? Theoretically, yes. However, how is the credit blank? Is it a CPN? Is it a foreign national just starting out with credit? If it’s a CPN, we won’t work with you and you shouldn’t waste your time or money with CPNs. If you simply have no credit, you’re in a really good situation and you can expect massive increases in credit score after adding authorized user tradelines. Is more better? Not really. You can abuse the process and it can actually backfire on you. This is why we recommend that you get started here and let us (at no cost to you) review your credit, goals and situation and make a recommendation. 1. We provide 100% compliant services. if you are concerned about the specifics of legal matters it is always best to consult an attorney (as we do regularly). 2. No, your credit would not be hurt as the protection of our cardholders is of the highest priority through all transactions. We qualify and screen every client individually to ensure that our cardholders, and their accounts, are safe. And a member of our vendor team will reach out to you on how to get started.